At Caxy, we've noticed how much nonprofits rely on the internet for charitable donations and connecting with donors. In fact, well over half of all connections with charitable organizations in the U.S. now occur on mobile devices. While marketing to donors isn't exactly the same as connecting with for-profit customers, both of these efforts need high-performance, engaging websites, apps, email campaigns and other marketing activities. Maximizing the good work that nonprofits do also requires improving employee workflows. That's why successful organizations have relied on us for nonprofit web design and app development for decades. DiscoverDesign: The Chicago Architecture Center started the website, DiscoverDesign, to encourage young people to explore skills in design through age-appropriate challenges. An example of one of these challenges might be designing a quiet space within the student's school using popular software like Minecraft. DiscoverDesign asked us to add more features to its site. It hoped to find a digital way to handle administration, award badges and offer feedback. We used Drupal CMS for our nonprofit website design and development to manage the badges and feedback. We also integrated our system with Chicago City of Learning and formatted the data for export to Tableau visualization. As a result, our project delivered on all requested features. It was also featured in a Mozilla Foundation MozFest in London. This award gave the organization local, national and even global attention. Field Museum: The Field Museum website serves a wide audience with different needs. The museum approached us to improve Americans with Disabilities Act compliance and the way the site handled access for people with different user roles. We also made sure the website was fully responsive for people with different devices and changed the way that the site managed workflow and allowed access to certain features for users with varying roles. Our project produced a responsive and usable website that managed workflows and user roles well. As an extra benefit, our work helped improve SEO for the site, so the Field Museum could attract a wider audience. Nonprofit Progressive App Development: Progressive web apps give our clients and their users the benefits of both a mobile app and a regular website. For instance, users can access progressive apps by using a website URL. At the same time, they can take advantage of the features offered by both an app environment and an Internet browser. Clients that come to us for nonprofit progressive app development also find that their app can improve SEO in a way that traditional mobile apps will not. SEO and Digital Marketing: As a full-service digital company, we will also work with nonprofit organizations to improve their outreach campaigns. Our services include email, search and social marketing. In many cases, we test various tactics and then train the in-house marketers in ways they can keep up this momentum in the future. We also offer HubSpot automation consulting to help nonprofits run their online marketing campaigns more efficiently and effectively in the future. Why Work With Caxy on Nonprofit Web Design, Development and Marketing? Our Agile development process and commonsense approach help us deliver projects on time and within tight marketing budgets. In addition, our award-winning designers will engage more donors and help nonprofits get recognized for their investments. 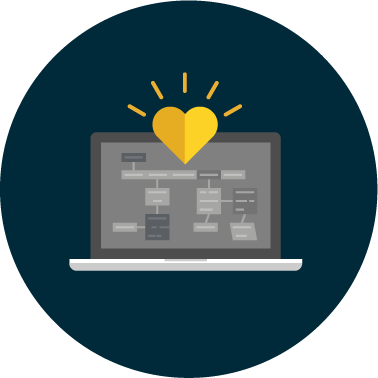 We consider all facets of the user experience and the workflow for employees when we approach a project for nonprofit organizations. Do you have concerns about your nonprofit's digital presence or simply have a great idea that can help your organization work better for all stakeholders? If so, we'd enjoy hearing about your worthy cause and offering our suggestions. Contact us today to learn more about the many ways that our nonprofit web development work can help. How can we help you revolutionize your market? We live to make engaging digital experiences.